A spectacular collection of two different varieties of banana plants, perfect for the UK climate! The ‘Red Abysinnian’ is a relative newcomer but it’s not hard to see its appeal. Its giant leaves can reach 75cm long in a season but what really stands out is how they are heavily veined burgundy red, and in full sun the leaf edges have a very red tinge. The Japanese Banana ‘Musa basjoo’ is a more typical kind of banana plant with giant fan-like leaves that will unfurl as they emerge each year through the central trunk and within 3-4 years you will have leaves over 1M long! Plant into large pots for instant impact and a tropical feel. talking point. Supplied as a set of 2 potted plants in 1L pots approx. 50cm tall – one of each variety. Bring a real warm, tropical feel to your garden, patio, balcony or even terrace with these architectural banana plants that have recently become very popular in the UK thanks to their stunning large, paddle shaped leaves and tolerance to the UK clime! Now you don’t have to travel far to find a piece of the exotic…simply step out of your back door! Perfect for growing in large heavy pots and in sunny spots, these banana plants will contrast against each other to give you something different to admire. 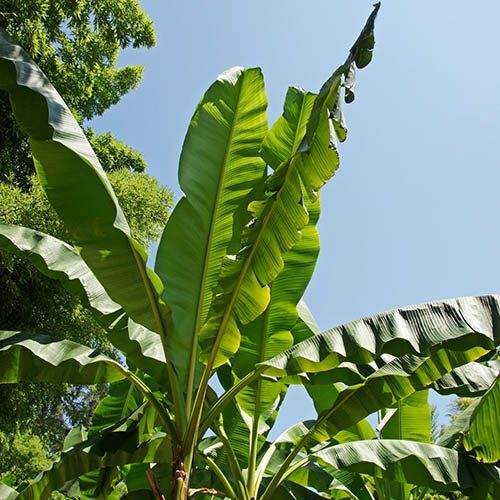 The Japanese Banana ‘Musa basjoo’ is a more typical kind of banana plant with giant fan-like leaves that will unfurl as they emerge each year through the central trunk and within 3-4 years you will have leaves over 1M long! Hailing from Japan, it loves sunshine but it is hardy to -6C perfect for the UK climate! This Japanese Hardy Banana is brilliant if planted into a large pot and will create a real tropical feel to your garden. Watch as the leaves spread gloriously out through the air, creating wonderful shadows on your patio! 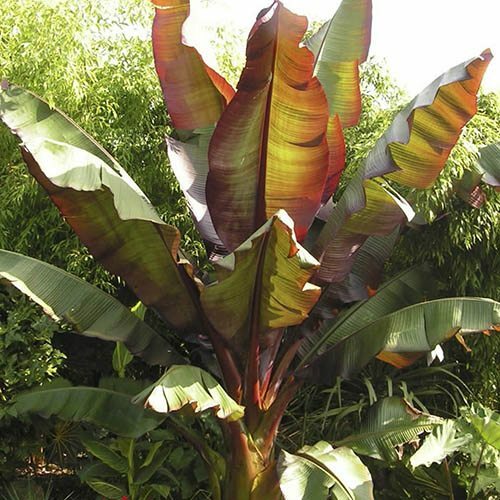 Each plant in this collection is much shorter and less vigorous than other huge banana plants too at around 4-5ft tall maximum, making them ideal for large pots in small gardens - grow in full sun or shade, it makes a great talking point. These banana plants are so easy to grow and make great exotic looking patio focal points! Note – these banana plants do not produce any edible banana fruit, not even tiny ornamental ones. Plants arrived in good condition and look really good. Waited a while for them 2 come had 2 email u 2 find out where they were. After having a previous bottle brush plant replaced with another which was not up to standard I thought this one which was for a present would be in good condition etc. I was wrong.